The Government Accountability Office recently reported that the pilot program for the DATA Act, passed in 2014 to increase savings and transparency in federal spending, is still not up and running. The pilot program had not yet specified a methodology or data to be collected, and its outcomes are unlikely to be scalable. To avoid missteps like these, federal agencies need a change management strategy that involves gathering evidence, meticulously outlining goals, and testing iteratively. Assess: Use surveys, qualitative data collection methods, and stakeholder facilitation to gather a detailed understanding of the situation. Dialogue: Through a series of targeted conversations, map out your organization’s desired behaviors and performance expectations. This communication is necessary to align all stakeholders to a clear goal. Design: Based on previous steps, meticulously plan your organization’s change efforts with detailed documentation and scheduling to sustainably drive all departments through to completion. Implement: With plans aligned and finalized, roll out the changes with touchpoints at the individual, departmental and organizational levels. Coaching will ensure optimal performance at each step. Sustain: Periodically reassess leadership behaviors and cultural health, as these are the keys to a program’s success. Work environments are dynamic, and leaders must adapt and stay on course to achieve the desired results. The ADDIS model aligns with the iterative concepts of agile development and beta testing. To implement long-term change, proposed interventions must be applied in smaller organizational areas or with trial stakeholders during the “dialogue” and “design” phases. Test these interventions, learn from successes and failures, and determine when your change strategy is ready for a full rollout. One municipal transportation agency used the ADDIS model, which began with a rigorous assessment of its organizational culture and a plan to improve safety behaviors throughout the organization. Using quantitative and qualitative metrics to assess change agents’ perceptions, the data collected during the “sustain” phase revealed what worked well in the agency and pinpointed areas for continued growth. More than 40 percent of respondents to a leadership feedback survey said they understood the key role they play in advancing the agency’s mission. An additional 27 percent reported an increase in the overall awareness to the challenges and goals of each department, while 25 percent said they have a better understanding of how they relate to the needs of each department. 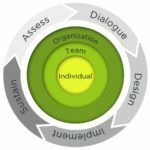 These findings indicate that after following the five steps of the ADDIS model, agency stakeholders are aligned to specific individual, departmental, and organizational goals. To keep this momentum, the agency must continue reinforcement, strategic planning, and open communication to ensure accountability for these goals. Scoping conversations: Before developing an ADDIS project plan, meet with the project’s internal sponsors and other team members to ensure everyone is aligned with its scope, key activities and milestones, and detailed timelines. Learning needs assessment plan: To fully understand organizational needs and desired outcomes, develop an assessment plan that outlines what is required to meet agency objectives. Measurement and evaluation plan: Identify which metrics to capture and track throughout the life cycle of the project to gauge its success and ensure its impact. Communication strategy and plan: Stakeholders should feel like something is being done with them, not to them. Keep them informed and engaged throughout the process using a robust communication plan. Project kickoff meeting: Conduct a brief session with internal sponsors and stakeholders, and share draft versions of any plans. With all parties aligned to the process and its goals, you are ready to implement your change strategy. Through ADDIS, federal agencies can develop a deep understanding of the changes they face and the best way to execute them. With rigorous testing, well-established goals, and continued assessment, federal change management doesn’t have to be as difficult as it looks in the news. This article originally appeared on Federal Times. Bradford is a results-oriented strategy advisor. His strengths include organizational restructuring, visionary leadership, strategic business planning, and program/project management.